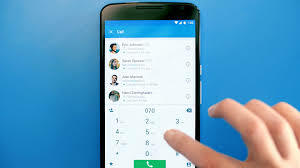 The Truecaller use millions of people worldwide. And you probably also used it. If not, we give you information about this. Whenever someone calls you from an unknown number, the Tracker App lets you know the identity of that user. The tractor makes contact details through all the user's smartphone's address book. Maybe you have never used this app but your number and name are still in the database of the truckler. Because maybe before your number is using another and he has stored his database on the Truecaller. Not everyone knows this, but the Tracker App also tells some fixed line phone addresses. If there are a telemarketer and a spam call from an office address, then there is no problem. But you would never want that a person should know the address of your house, that too only because you called him. True, the tractor gets this information from the public data store. This is because someone knows your landline number, In addition, know the registered address of the phonebook available in the public sector. Or, by entering your landline number in Google, your address will be known. In this case, you would like to get rid of your number from the database of the tractor. Keep in mind that if you use this app you can not remove your number from this service. You have to close your account to delete the number. If you wanted to know the contact details of others by removing your number then this is not possible. On iPhone, Android or Windows Mobile, you can deactivate your tractor account like this. Open the app> Tap People icon in the top left corner> Settings> About> Deactivate account. Open the app> tap on the gear icon on the right side> About the scroller> Go down> Deactivate the scroller. Open the app, then tap the three dot icon appearing on the bottom right corner> Settings> Help> deactivate the account. 1. Go to the Truecaller unlist page. 3. Tell the reason for choosing an option to unlist. If you want you can tell another reason in another form. The tractor says that it removes these numbers within 24 hours of getting the unlist request. This does not mean that your number will not always exist in this service. We removed our number a year ago During this time we did not use the Truecaller, but our number once again appeared on this service. The right way to do this is to check with someone who knows the identity of the tractor, whether or not your contact details appear. If not, then you managed to remove your number from the truckler. If you see, you can always ask to remove your number from the Truecaller. For More This Type of Information Click On Bell Icon And Subscribe Us.